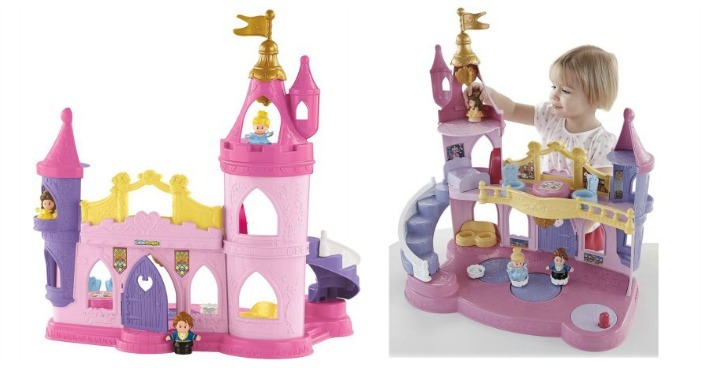 Disney Princess Musical Dancing Palace Just $24.97! Down From $55! You are here: Home / Great Deals / Disney Princess Musical Dancing Palace Just $24.97! Down From $55! Right now you can get this Disney Princess Musical Dancing Palace for just $24.97 (Reg. $55) at Walmart! Your child will enjoy the many features of this adorable Fisher-Price Disney Princess Musical Dancing Palace. The princess characters Belle and Cinderella each had magical moments in a place just like this. And now, with the little people musical dancing palace, kids can recreate those special moments for themselves. Spin the lever to see your favorite characters spin and twirl around the floor with the prince. That’s when the magic happens with music, sounds and phrases like “Isn’t this music beautiful?” Bring a friend over to join in with the excitement of this little people dancing palace. Together you can relive scenes from the movies or make up your own unique adventures.